Winter crafting continues in much the same vein here; my Wool and the Gang Rose Cardigan, Angus's blanket and my long forgotten (I think it had a cobweb on it) My Sweetiepie ABC Sampler. 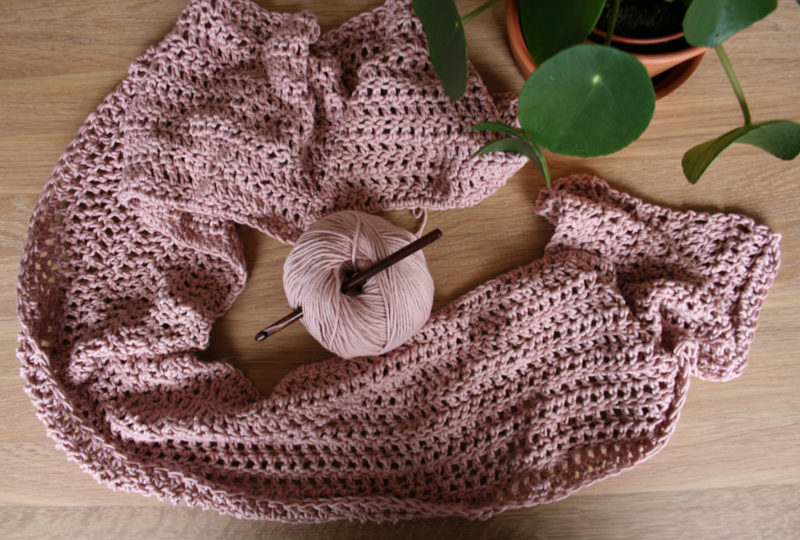 My cardigan is a pleasure to work on (that dreamy cotton!) but it does feel a lot like making a blanket. Long rows, up and down, all the same. But I know it will soon be finished and the thought of wearing it motivates me. I continue to plod away with Angus's Granny Stripe blanket. I think he'd actually forgotten I was making it, poor love, and so the other day I showed it to him. He looked crestfallen. "I was hoping it was going to be black and white." he said. "But it's not. I suppose I can cope." Great. Crochet blankets take a really long time to make. That's not necessarily a bad thing, but I find that I get bored and lose interest, to the point where I no longer like the yarn, colours or pattern any more. It turns our Angus does too. The cross stitch sampler can wait until spring. Every now and then I pick it up and half heartedly stitch a little, but I'm never in the mood, I'm too tired or the light isn't right. I'm not worried though, I still love this piece and I know I'll pick it up again and enjoy the stitching when the time is right. You'd be forgiven for thinking that I've fallen out of love with my winter projects, with crafting, but I haven't at all. It's just that I am completely consumed by thoughts of decorating and painting. It's all I can think about and I am obsessed with redecorating all our bedrooms this spring and summer. I have virtually no budget but a huge amount of energy, ideas and enthusiasm. I want to rip up our hideous, stained carpets, paint walls and floorboards, give orange pine furniture a new lease of life with a lick of paint, move things around, refresh and renew. It's the time of year. I always get like this when spring is round the corner. We have rooms and cans of paint waiting hoping we'll soon have the energy to get going. My craft projects are moving at a snail's pace, but I'll get them done eventually. We have nearly 2 months of winter left, and we have hardly begun with the wintry weather, so I'm still very much in a cosy frame of mind and enjoying it. What a lovely pictures! I am looking forward to your cardigan. Aaaw, poor Angus - didn't he choose the colours like Bella chose those for her blanket? Whatever you'll be doing, I am sure it will look great! Once you can get a bit of decorating done, you'll probably want to craft again. Yes we do sometimes lose interest if the item is big or the same old, same old over & over again, but we push on and then we can enjoy the finished product. I think the rug is lovely & your embroideries are cute. Look forward to seeing everything come together over the coming year. Take care. I always feel like I need to follow wherever the current passion is leading me. No point in fighting it! We are in the process of decorating too. It's so nice to give a space a new lease of life. I know what you about crochet blankets, I have one stuffed in a bag that I pull out occasionally. I've been working on it for two years! I adore reading your blog & following you on instagram thank you so much for sharing your ideas, thoughts, projects and recipes. 2016 was a particularly difficult year for me after losing my lovely dad to cancer. At times I felt utterly bereft despite working full time, being mum to 4 wonderful kids & having a really supportive husband, however I found your blog posts a much welcome distraction so thank you once again. Maybe Angus wanted a badger blanket? I just love the colour of that yarn! A soft pinky-grey which reminds me of the colour 'oyster' from the 1930s.